Source: Greenville News Online (April 7, 2018) – A year ago, developer Jack Shaw’s land at Interstate 385 and East Butler Road included a half-mile paved loop around an empty, 10-acre field. Today it is the site of BB&T’s 140,000-square-foot, 700-employee mortgage center. And more than 140 acres of dense woodland cradled between the Reedy River and Butler Road to Mauldin’s west is set to be annexed and transformed into a sprawling residential development. The developer is actively working with Mauldin on his plans there. You might say that Mauldin — once known as “Butler’s Crossroads” and still described broadly as a drive-through bedroom community — is going through a growth spurt. It’s not by accident, and the city’s community development director, Van Broad, says it’s long overdue. City leaders are intent on losing their suburban vibe and becoming a smaller version of their popular and fast-growing neighbor: Greenville. Caristrap International’s new corporate headquarters on Brookfield Oaks Drive, a $5.5 million investment that will create 100 jobs. Mauldin got its name 128 years ago in honor of the man, Lt. Gov. W.L. Mauldin, who brought a train depot to Butler’s Crossroads. Mauldin is bounded roughly by Interstate 85 to the north, Interstate 385 to the east, Interstate 185 to the south and the Reedy River to the west. Businesses catering to drive-through clientele set up shop in strip malls over the decades, and 1970s and ’80s-era auto lots and tire stores along Main Street complete the picture of a motor city — a pass-through town. And while the city has grown to just over 25,000 people in recent years, “Mauldin” is not the city listed on everyone’s address here. Parts of Mauldin share zip codes with neighboring Greenville and Simpsonville, and it’s those cities whose names get on the address label. It wreaks havoc on the city’s identity and even caused Councilman Taft Matney some trouble when he first ran for office in 2013. He lives inside Mauldin city limits but has a Greenville mailing address, prompting some voters at the time to challenge his qualifications. The Brookfield office complex, also in Mauldin and featuring such high-profile tenants as Verizon, also has a Greenville mailing address. “We don’t want to be gobbled up by cities beside us,” Broad said. “It’s not infrequent that we have to do that, when you see those major economic development announcements,” said Matney, who also heads up the city’s economic development committee. Mauldin’s leaders credit the city’s growth spurt to a collective and growing pride in its identity and a newly aggressive marketing plan — coupled with two priceless assets: fortunate geography just off three interstates near Greenville and a lowest-in-the-county municipal tax rate. To spread Mauldin’s story, Broad successfully increased the city’s marketing budget ten-fold to about $150,000 since he came on board in 2015. His in-house team has bought radio spots and regional billboard space to promote events and placed print and online ads in regional and national publications to tout the city as a prime place to live and do business. City leaders are also determined to not allow its neighbors to encroach on Mauldin’s territory. Clemson University’s International Center of Automotive Research is a $250 million hub of public and private research just off U.S. 276 that still has 200 acres of undeveloped land. The city of Greenville annexed ICAR more than a decade ago — starting a creep of annexation up 276 toward Mauldin that Broad says his adopted hometown never should have let happen. 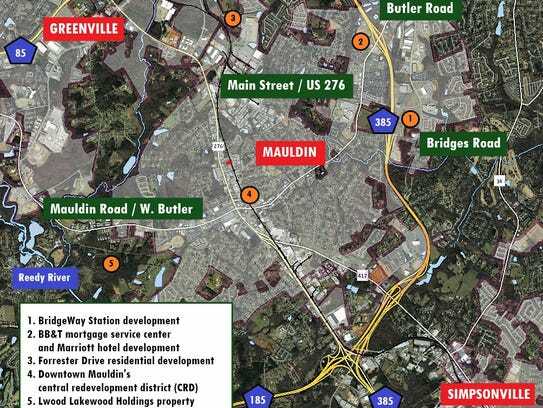 These days Mauldin is undergoing its own round of annexations up U.S. 276 and West Butler — thereby knocking on Greenville’s door. This winter, the city annexed 89 acres around Forrester Drive about a mile from ICAR. The city is poised to annex another 140 acres this year on West Butler/Mauldin Road — also about a mile from the Greenville city line. Consider this: First-floor retail space along Greenville’s Main Street goes for just under $40 a square foot, according to recent listings, whereas commercial space near the crossroads of Main Street and Butler Road — Mauldin’s commercial center — goes for under $7 a square foot. It’s something that Crave Coffee co-owner Julie Ellis and business partner Mark Bergstrom, who opened their cafe in November and have operated Seasons Catering nearby on East Butler for four years, noticed. Ellis said they broke with the trend to open shop in downtown Greenville because Mauldin is so affordable. It’s also close to a growing lunch crowd, is easy to get to and has plenty of parking, Ellis said. She lives two miles from Mauldin, and her businesses are both on East Butler. Broad said he follows up on every lead that comes his way, working closely with Upstate SC Alliance, the state Department of Commerce and the Greenville Area Development Corporation. He even took a tip about an unincorporated parcel on Forrester Drive — the one near ICAR that Mauldin recently annexed — from the city’s fire chief. The chief had struck up a conversation with a woman near the scene of a call and she mentioned she wanted to sell. “I called her; we had a great conversation,” Broad said. “I partnered her up with a developer working on another parcel, and lo and behold, it happened. “It’s an under-served market,” Broad said. Longtime resident Brian Daughhetee sees it, too. He said he’d still like to see more diverse eateries. Last summer, and continuing into this spring, the city established a moratorium on new construction inside the area, located at Main Street and Butler Road. And in the fall, council members designated 25 acres at and around City Hall as Mauldin’s Central Redevelopment District (CRD). Meanwhile, the city is entertaining proposals from private developers for redeveloping the new central district, a deal sweetened with major city and county tax incentives approved in July. Aiken native Keira Kitchings has been Mauldin Cultural Center director for 18 months after running arts programs in York County, Jacksonville, Florida, and Fountain Inn. She has expanded arts lessons and programming there while also presiding over $1 million in improvements to the building and grounds. Much of the city’s advertising — which she helps design — has been for her events. “When I drove through Mauldin the first time, I thought, ‘I don’t really know — it’s a small town, not a lot going on,'” Kitchings said. “But when I had my interview, the whole team from Mauldin, like six people, they talked about all the changes they wanted to bring.